After the excitement of the Autumn Bird Race a group of bittern-inspired, hotdog-warmed stalwarts turned their attention to raking-up cut vegetation on the eastern section of Ely Common. This is part of a long-term programme with the Wildlife Trust and ECDC to restore the site’s flower-rich meadow – removing nutrients and scarifying the exposed soil so that it can be sown with seed from Chettisham Meadow. 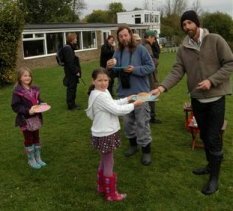 Fantastic teamwork plus the lure of flapjacks meant we finished just as the drizzle started, so the Wildlife Trust can now seed the site before the winter frosts set in. Many thanks to everyone who turned up. 17 November 2012 The 4th Ely Wildspace Bird Race ran on Sunday 21st October, with a dozen or so enthusiasts setting off at 7:30am. Three groups led by Ben Green, Duncan Poyser and Mark Welch accumulated a collective tally of 66 species. The highlights were brambling, bittern (the latter seen on the main pit), a mandarin duck and, a comparative rarity for Roswell Pits, meadow pipit! The air was alive with visible migration, involving sizeable flocks of finches and woodpigeons. bird race invitationA group of nine siskins was seen, as were several singles in mixed finch flocks. Small flocks of golden plover were seen passing over the pits, piping as they went. The event finished off with a very enjoyable barbecue at Ely Sailing Club, which was hosted by Eliza and Isabel of 1st Ely Brownies. Their excellent service earned them their Brownie Hostess badge. Well done Eliza & Isabel! Many thanks to Ely Sailing Club for the use of their facilities.